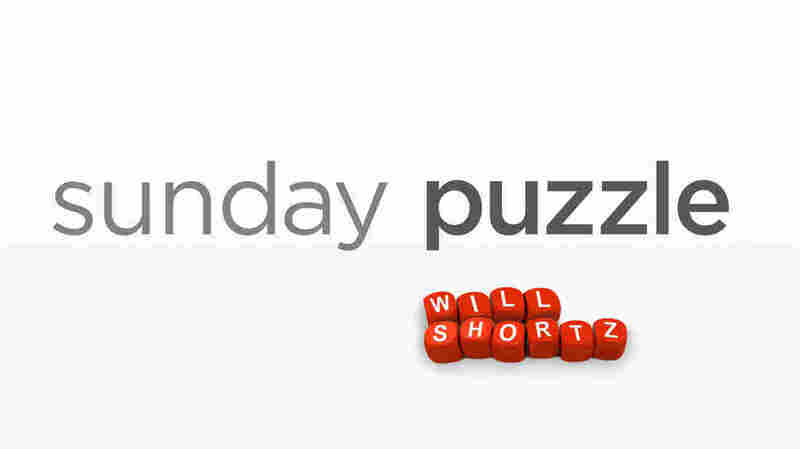 Sunday Puzzle: Shuffle A Couple Letters For This Category Challenge NPR's Lulu Garcia-Navarro and Weekend Edition Puzzlemaster Will Shortz play a word game this week with KCFR listener Richard Bauman of Golden, Colo. I'm going to give you two words. Change one letter in the first word to name a category of things. And change one letter in the second word to name something in that category. Last week's challenge: Last week's challenge came from listener Steve Baggish of Arlington, Mass. Think of a well-known brand name in 8 letters starting with H. Change the H to an M and drop the last letter. You'll get another well-known brand name in 7 letters. What commercial names are these? Winner: Richard Bauman of Golden, Colo. This week's challenge: This week's challenge comes from listener Joe Krozel of Creve Coeur, Mo. Name something you see when going to the movies, in two words. Change the sixth letter to an R, and you'll get something you might buy at a grocery, in three words. What things are these? If you know the answer to next week's challenge, submit it here. Listeners who submit correct answers win a chance to play the on-air puzzle. Important: Include a phone number where we can reach you by Thursday April 4, at 3 p.m. ET.